The curtain rises. A singing and dancing troupe begins a prayer to Lord Ganesha; they pray that the audience should enjoy the show, and that no vighna (obstacles) should mar the performance. Then the narrator (Nayak) comes up on stage and welcomes the audience. Just as he begins telling us about the performance that night, he is rudely interrupted by a boisterous comedian (Rangla) who knows nought but the love of food and pretty women. Nayak is unfazed, and proceeds once again to tell us about the performance. “We are going on a trip,” he says. “Down the history lanes of a city that is none other than the very child of the Sun God – Surat!” “Do you know how hot it is out there?” butts in Rangla. “It is almost 50 degrees! And there are 250 people in the audience. How in the world do you plan to take them around a whole city in such a short time?” “All I need is my brain,” replies Nayak, and they begin their journey. In the next 45 minutes, they take you on a journey through the great city, starting from its mythological birth right to the sights and sounds of the current day economic hub that it is. What does this sound like? A PR gimmick? 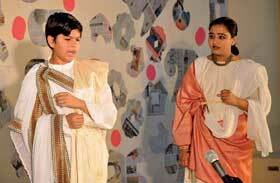 A multi-crore theatrical show to commemorate some landmark event in the city? Wrong answers, all. This, believe it or not, was the final presentation of an 8th grade history project. I first heard about the project from Roo Jhala, a mentor-of-sorts, at the monthly meeting of Theatre Professionals Pvt Ltd, a company that I have been working with for the last year. The project was offered to a few other people apart from the drama facilitators working for the company. Neither I, nor any of my colleagues knew what to make of it. My first instinct was to turn it down. I have never directed a full-scale children’s production before; I am not sure what they want from it; history was never really a strong subject; the payment isn’t great; Jalgaon is too hot and way too far… I tried every excuse in the book, but Roo didn’t give up, and the next thing I know, I was on the phone with Mr Krishnakumar, the 8th grade history teacher of Anubhuti School in Jalgaon – the man who had set the project. The call lasted for about half an hour (turns out, I was the first one to have called, accepting the project) and at the end of it I still didn’t have clarity, but the curiosity had kicked in; I wanted to find out if this could actually be done. A week later, I was in Surat with 43 children and their chaperones on their research tour. The author is an active theatre professional working on and off the stage while she is not in the classroom trying to get children to do the same. She can be reached at sridharan.shruti@gmail.com.